Due to the advancement of audio technologies reel to reel audio tapes are now classified as a rare item. The biggest problem with the reel to reel tapes is a fungus. The fungus is developed on old unused tapes due to humidity exposure. Also, another problem with old tapes is that the lubrication on the surface of the tape starts to deteriorate and tape starts to stick to itself, and this leads tape to break during the playback. Most of them that have Fungus can be fixed by using a tape cleaner. But these days reel to reel tape cleaners are not available to buy and because of that, we decided to build simple tape cleaner by using parts of old reel to reel tape players. 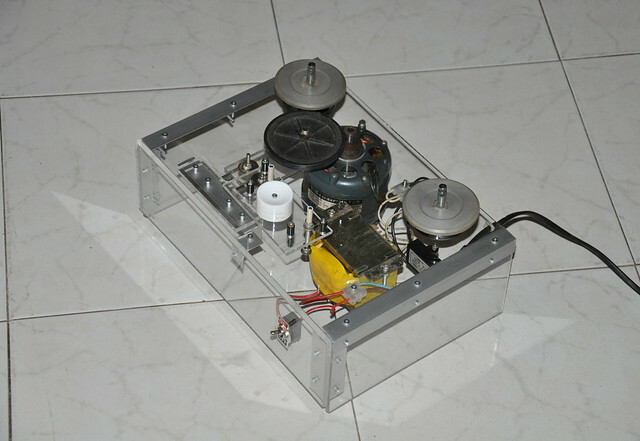 The core component of this player is an induction motor which we got from an old reel to reel player. The motor which we used in this project is the Sony HC-134. HC-134 is 100V single-phase, capacitor run, induction motor with 1500 - 1800 RPM. Recommended auxiliary winding capacitor for this motor is 1.5μF. To deliver 100V AC to motor we use 3A, 230V to 100V step-down transformer. High-resolution photographs of this reel to reel tape cleaner are available at my flickr.com page.